Heart to Heart is a special fund of Ren De Foundation. 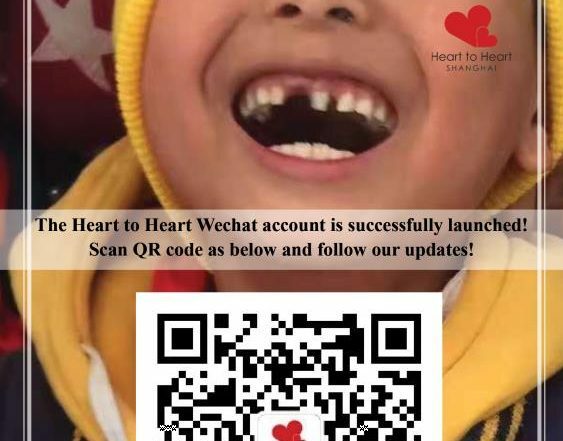 We are a Shanghai based charity which provides corrective surgery for Chinese children from all over China with congenital heart defects (CHD) whose parents are unable to afford the surgery. To date H2H has sponsored over 1,346 children for heart surgery. The surgeries not only saved their lives, but transformed the lives of their families. Heart to Heart is proud of the fact that we are and always have been a 100% volunteer organization. We have no paid employees. We also have a $0 operating budget which means that 100% of donations are spent for surgeries. Sponsors are given documentation on where their donations were spent and can also visit the children while the children are in the hospital for their surgery. Sponsoring a child is a truly moving experience. How did Heart to Heart evolve? Thousands of Chinese children are born with congenital heart defects (CHD) each year. These defects usually require heart surgery. Many rural families have no health insurance or savings to pay for the surgery nor can they earn enough to save the amount needed. Without surgery the children will die due to failing hearts or secondary causes. In addition, life is compromised for the children since they are often unable to walk to school, which is necessary in most rural villages. Their families are also in dire straits since the children require frequent trips to the hospital as well as expensive medicine. H2H provides corrective heart surgery for these children. Their families must provide an official poverty certificate and other documentation to qualify for assistance. An average family who qualifies for this program makes between 3,000 – 20,000 RMB per annum combined family income. H2H contributes 30,000 RMB towards each such surgery. This amount usually either pays for the entire surgery or provides enough funds to enable the child’s family to be able to finance the remainder of the funds necessary. To date H2H has sponsored over 1,346 children for heart surgery. The surgeries not only saved their lives, but transformed the lives of their families. We are proud of the fact that we are a 100% volunteer organization. We have no paid employees. We also have a $0 operating budget which means that 100% of donations are spent for surgeries. Sponsors are given documentation on where their donations were spent and can also visit the children while the children are in the hospital for their surgery. Sponsoring a child is a truly moving experience. Project Background. Visits to our sponsored children’s rural homes, villages, and schools made us aware of their very basic living and educational environments. Most books and educational aids were either old or non-existent. Discussions with headmasters and local educational officials revealed that little to no funding was available to the schools for library books. We established that RMB 20, 000 would purchase a large selection of curriculum supporting reference and library books. We also found it would be most appropriate and cost effective if the headmasters selected and purchased the books needed on credit with a regional supplier. Heart to Heart would then pay the supplier. School Selection. Before a school is selected for this project, H2H must receive the RMB 20,000 donation. The required RMB 20,000 can be from a single sponsor or a combination of donations of lesser amounts. We rely on the same agencies that source needy children for our congenital heart surgery sponsorship project to investigate which schools are in most need of school library books. These agencies are asked to visit with the schools to investigate their needs and to provide Heart to Heart with full information on the poverty level of the schools. Heart to Heart Audit. H2H checks to make sure the RMB 20,000 donation is correctly spent on school library books, computers, or shelving needed for the library. To do this we combine our quarterly provincial sponsored children visits with library books presentation ceremonies. Generally, the books are purchased just before our visit …and the supplier is on hand ready to receive payment. H2H requires that we receive a manifest of all purchases and a full receipt (fapiao) before we hand over the cash for payment. We also ask that all purchases be available for our spot check audit. Library Book Sponsors: Reports. When a sponsor makes a payment to H2H, the sponsor is given an approximate date that their donation will be used. At this time the name of the school is not available. Once the selection procedure has been finalised and dates confirmed for our visit, the sponsor is advised of the name and the location of the school selected for their sponsorship. The sponsor is invited to accompany us on our field trip to visit the school and to take part in the presentation ceremony. During the presentation ceremony, the school is presented with a bookplate stamp bearing the library books’ sponsor’s name. Once the field trip has been completed, the library book sponsorship record is finalized. A copy of this report along with a copy of the paid invoice (if required) is given to the sponsor. The report has the full contact details for the school along with an observer’s report as to its condition and needs. Should the sponsor wish to give the school further support we encourage them to do so and can provide contact details of the local support agencies that may be of assistance. As of January 2018 H2H has sponsored and/or facilitated the sponsorship of 122 rural school libraries. Heart to Heart focuses on helping Chinese children obtain heart surgery when their families don’t have insurance or the means to pay for the surgery. What most people don’t realize, however, is that when a child and his/her family come to Shanghai for surgery, the family has little to no money to be able to stay anywhere or to eat. They will be in Shanghai anywhere from 2 weeks to several months while their child has and recovers from surgery. This is definitely a problem. The idea to support not just surgery for our sponsored children but to help their families has always been a red light flashing in our minds. The accommodation problem was solved by the hospital since they allow the families to stay in the room with their children. It may be crowded and uncomfortable, but they have a place to sleep – in the bed with the child, on an extra chair, or on the floor. The families don’t, however, have funds to do anything else. Working closely with these families on a daily basis, you realize just how little they arrive with and how little they manage to survive on during the hospital stay. It’s scary to see how few possessions, food, and money they bring for their long stay. But then they don’t have anything to bring. Quite a while ago, we started to support the families with a bag of clothes, toys and toiletries when they arrive. It was obvious, however, that the families still struggled. As a result, H2H opened a food bank in 2014 which gave the families ready to eat food (just needed boiling water or a microwave) while they were at the hospital. In 2015 it was expanded. We now give each of the families a meal card when they check into the hospital. This allows them to eat 1-2 nutritious meals each day in the hospital cafeteria during their stay. Depending upon the circumstances, we may also give them a food bag upon arrival, which contains drinks, snacks, instant noodles, etc. that will help them between meals. Their relief to receive the card and food is obvious. If they stay over two weeks, we try to supplement the card and snacks. Naturally, this all costs money, but is very reasonable. Yodak Hospital, for instance, has graciously discounted cards for Heart to Heart. Thus, RMB 3,000 will provide food for 17 families during their hospital stays! It’s a great way to support our sponsored children and their families during an extremely stressful time for them. When Heart to Heart Shanghai was first formed in June 2003, it was a hospital play group. Knowing that movement helps recovery, Shanghai Chest Hospital wanted people to come play with children after their heart surgeries to speed up their recovery rate…. and so the children could have some fun. What started as an occasional afternoon each week for a few volunteers has expanded greatly over the years. We now have a permanent playroom at Yodak Cardio-Thoracic Hospital in Puxi. There are two wonderful rooms full of donated toys, books, games, puzzles, etc. where volunteers can interact 365 afternoons a week with children who have been hospitalized for heart problems. It is a wonderful place for the children and volunteers alike. Everyone enjoys themselves and the children get better faster as a result. It’s a perfect arrangement. If you like interacting with children (1 month old to 18 years old), this program is the one for you. You can volunteer every day or once a month. Participation levels are totally up to you. No language skills are needed since children respond to smiles in any language. What do volunteers do? The playroom is open from 2:00 – 3:45 each afternoon all year long. Volunteers clean up after the playroom closes, but it usually doesn’t take too long. If you are interested in volunteering with us, please fill out an application in the “Volunteering” section of the website, have an orientation and then join in the fun. The children are looking forward to meeting you! 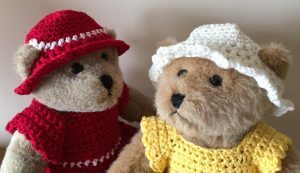 In October 2005 we launched our heart bears project. 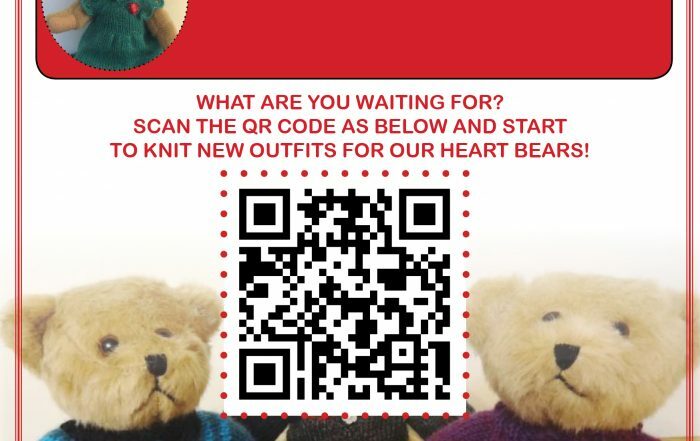 Each heart bear wears a cardigan, dress, or outfit hand-knitted/sewn by our volunteers. 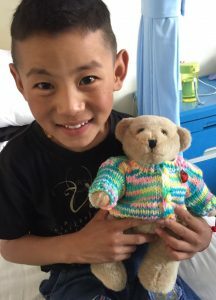 Each bear is personalized with a nametag bearing the name of a Chinese child who has previously received sponsorship for heart surgery. You can view a photograph of the children in the sponsored children section of this website (just click on “See More Children”). 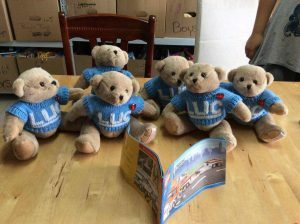 Our heart bears are not only cute, but they raise awareness of the work Heart to Heart Shanghai successfully undertakes. Also, quite a few of the heart surgeries are made possible through the sale of our heart bears. All profits from the sale of our heart bears go towards our life-saving and life-changing heart surgeries. The sale of just 166 heart bears finances a full surgery sponsorship. If you’d like to purchase a heart bear, please contact us at info@h2hsh.net. Please note that we also custom make bear outfits for companies, schools, social groups, etc. Depending upon the complexity of the design, we can usually make around 50 custom cardigans/outfits per month. They make great gifts for clients, students, etc….. and the profits go to a great cause. Once again, for orders, contact info@h2hsh.net. Heart to Heart would love to have goods you’d like to donate. Donated items are given to our sponsored children/their families when they check into the hospital for their heart surgery or the items are taken to villages, orphanages, etc. which need them. The need for donations is continuous. The recipients appreciate anything you have to give – especially any new or gently used clothing (adult or children), shoes, toiletries (from hotels, airplanes, etc. or full-sized), bedding, toys, etc. that you might want to donate. The only things we can’t take are breakable, electronic, or extremely large items. When you have accumulated donated goods, please let us know by writing to donations@h2hsh.net. We can then let you know what a good time to drop them off to our sorting/storage room might be. If you have large items/furniture that you’d like to donate, there are conditions under which we can take them….. Since H2H can’t ship or take large items to the countryside where our sponsored children and their families live, we don’t actually accept large items as donations. Instead, we try to sell the item(s) to the highest bidder(s). The process usually takes 2-3 weeks. Since we don’t have a place to store the furniture/other large items, we also ask that the donor store the item(s) until the bidding period is over and the winner can pick it up from there. Once a “winner” has been determined, the purchaser makes the arrangements with the donor for the pick up. The purchaser pays Heart to Heart directly for the item(s). Both the purchaser and the donor are invited to visit the child in the hospital who is sponsored for surgery by the transaction. If no one bids on the item(s), the item(s) stay with the donor. If all these conditions are acceptable, we would love to “have” your large items! Just send a picture of them (individually is best) to execdirector@h2hsh.net and we can get started. If the conditions aren’t acceptable, we apologize. We really wish we could be more flexible, but with no storage or operating budget, things along these lines are difficult. Where and How Do You Deliver Goods? The dates and times we will definitely be at our sorting / storage room can be found in the document “Assembly Dates” in the Activities / Assembly section of this website. If the times don’t work for you, you can contact donations@h2hsh.net to see if an alternate time can be set up. Deliveries should be taken to Yodak Cardio-Thoracic Hospital in Puxi. Just call DJ (18516254244) or Drew (15618880693) when you arrive at the parking lot and they can help get the items to our sorting room. Heart to Heart can’t finance surgeries, school libraries, or food cards without monetary donations. We hope you want to help! Be assured that 100% of your donation actually goes for the project you select. We do not keep any of the donations nor spend them on administration, goods, or anything else. Wire transfers – Transfers can be made in any currency to the Heart to Heart bank account. Transfer details are available from execdirector@h2hsh.net. Please note that only by sending the donation to us by wire transfer can we issue fapiaos. If you don’t need/request a fapiao, a standard Heart to Heart receipt will be issued. WeChat – WeChat wallet transfers can be made in RMB to our H2H QR code (see below). Please be aware that we won’t know whom the donation is from unless you put a note in the QR code record when you send it. Having your email address or WeChat id would be perfect if you would like a receipt and / or would like to be able to come see your sponsored child when he/she is in the hospital. Without your name and contact information we have no way to know who made the transaction. When your information is entered into the “note” section, a standard H2H receipt will be issued. Alipay – Transfers to Alipay can be made. Write execdirector@h2hsh.net for the details. A standard H2H receipt will be issued. PayPal – Transfers to PayPal (in currencies PayPal recognizes) can be made. Write execdirector@h2hsh.net for the details. A standard H2H receipt will be issued. Credit Cards – Credit cards can be used. Send a message to execdirector@h2hsh.net for the details. A standard H2H receipt will be issued. Cash – If you’d like to donate cash, please contact execdirector@h2hsh.net to arrange a time and place to meet. A standard H2H receipt will be issued. 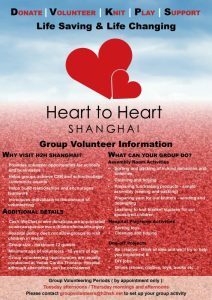 Heart to Heart Shanghai began in 2003 when a small group of volunteers started playing with children (post-heart surgery) at the Shanghai Chest Hospital. They did this in order to get the children out of bed and moving around. The activity made the children recover from their surgery quicker. At Heart to Heart we still keep up the playroom tradition. We have a large playroom at Yoda Cardio-Thoracic Hospital stocked with donated toys, puzzles, books, etc…. Children of all ages who are recovering from heart surgery come to play. There is usually quite the crowd of happy kids – temporarily forgetting about their surgery. Our playroom is open 365 afternoons a year so we definitely need lots of volunteers to play with the children, conduct art activities, read to the children, clean up, etc. If you like children, you’ll love this volunteering opportunity. What are the qualifications to volunteer in the playroom? There is only one – you must be at least 15 years old. If you are, please come and enjoy yourself while you’re helping the children recover from heart surgery. Just fill out an application in the “I Want to Volunteer” section of this website and someone will contact you with information about how to go to orientation and get started. The kids are looking forward to meeting you! What is Heart to Heart assembly? It’s what we call our team of volunteers who help us prepare for all the various activities we do to support our sponsored children and their families. Nothing could go forward smoothly at Heart to Heart without the assemblers. 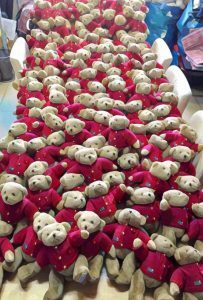 In our assembly group we sort donated goods, count coins, dress bears, clean, set up for events, prepare for field trips, sew on buttons, embroider …. the list is endless. We try to assign people to tasks they enjoy so don’t worry if you aren’t very talented in a certain area! No skills are required. All you have to be is at least 15 years old to participate. Assembly is usually a very social activity – lots of fun. We usually meet 1 – 2 times a week at our assembly room within Yoda Hospital. Our scheduled sessions are posted below and in the “Activities” section of the website. Generally, we meet on Tuesdays and the last Thursday evening of each month, although there are variations and extra sessions sometimes. We want your help so please fill out an application in the “I Want to Volunteer” section of the website and come help us. You’ll be glad you did! We always need knitters, crocheters, seamstresses, etc. to make heart bear outfits. You can help us in the privacy of your own home, work during one of our assembly sessions and/or you can join one of our knitting / sewing groups. We’d love to get to know you! To volunteer in this manner, just sign up in the “I Want to Volunteer” section and we’ll contact you with details on how to get started. 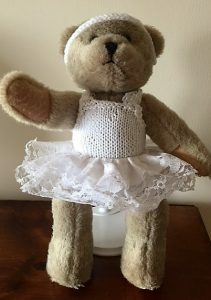 Our volunteers have been making outfits for the Heart to Heart heart bears almost since the founding of Heart to Heart in 2003. The heart bears are not only cute, but are made with love. ALL the profits from the sales of heart bears goes towards the sponsorship of children for surgery. 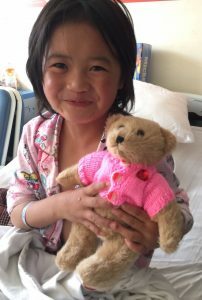 The costs are invested back into the purchase of more bears so we can continue the heart bear tradition.The sale of just 166 heart bears finances a child for surgery. 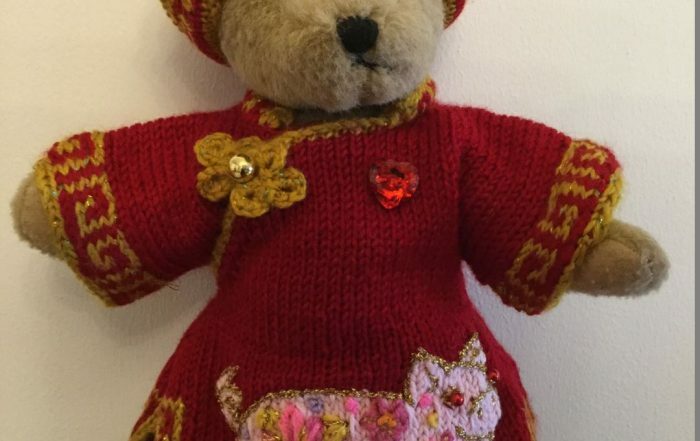 Each heart bear wears a cardigan, dress, or outfit hand-knitted/crocheted/sewn by our volunteers. 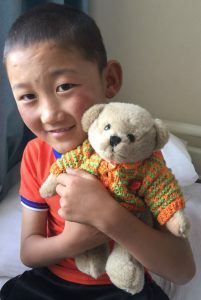 Each heart bear is personalized with a name tag bearing the name of a Chinese child who has previously received sponsorship for heart surgery. You can view a photograph of the children on our website in “See More Children”. 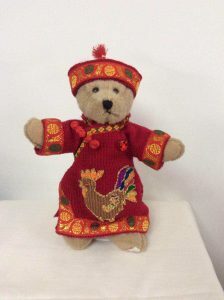 The heart bears are sold at school bazaars, social groups, companies, and through our volunteers. You can contact info@h2hsh.net to purchase heart bears. We also do bulk orders for schools and companies. A special heart bear outfit can be designed in your school’s/company’s colors and with your logo on it. Just make sure you leave at least 1 month per 50 bears for us to make them. After all, we are all volunteers – not a factory. You will love the results, however. Heart to Heart doesn’t actually hold many events itself. Our team of events’ volunteers, however, love to attend / participate in / help project manage events that others have organized. This team volunteers at bazaars and/or all kinds of events put on by schools, social groups, companies, communities, individuals, etc. If you want us to be at your event to spread the word about Heart to Heart, sell heart bears, or participate in other ways, just contact us at events@h2hsh.net. We’d love to cooperate with you. …. And if you’d like to help us on the events team, please do! We need a variety of skill sets and volunteering can be done at various times during the week. It’s perfect for people who have full-time jobs as well as those who don’t have a job. We need people who speak almost any language you can think of. All you need is a desire to help the children Heart to Heart sponsors for heart surgery and to have a great time with the public while volunteering. Go to the website section “I Want to Volunteer” to sign up if you aren’t already a Heart to Heart volunteer. If you already are a volunteer with H2H, just let the coordinator know at events@h2hsh.net and he can add you onto the team. Come volunteer with us! We need your help sorting donated goods, sewing, embroidering, and doing all kinds of other tasks. Please come and join the fun! Contact groupvolunteers@h2hsh.net to set up your group activity! We have many great supporters. Come out and join us at one of the events! Furniture Sales to Benefit Heart to Heart! Order Your Year of the Pig Heart Bear! What would you do if you were from a poor family with no health insurance, no savings and were probably heavily in debt …. and then your child was born with a congenital heart defect that could cause pre-mature death or other terrible possibilities. How would you obtain help? This is the situation that exists for the parents of most of our sponsored children (although we also help orphans). We try to help children born into these circumstances get the surgery their defect requires. Pictured below (in “See More Children”) are the children who have undergone surgery. We give a huge thanks to all the sponsors who donated the money to make them well and able to lead the lives their parents had originally dreamed of for them.